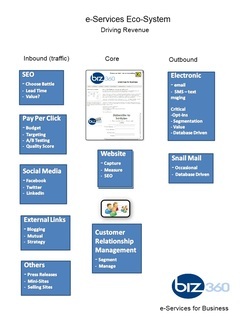 We take a holistic view to e-Marketing. There are many choices. We will help your business sort through the options. How Is Your Business Leveraging the Internet? - Search: We all know "print" for marketing is in decline. Newspapers and magazine publishers are folding all over. The Yellow Pages are going the way of buggy whips. When is the last time you sought out the behemoth book, thumbed through the ads, looking for the right company that was close by? Now we Google from our desktops or our phones for exactly what we want, close to where we are, maybe look at some reviews, comparison shop -- then get a map a driving directions. - Buyer Driven: Tools are available to the buyer, whether they are B-2-B or B-2-C has changed the paradigm. Buyers are driving the sales cycle. Learning and comparing on their schedules, after business hours on the weekend, etc. - Technology: For instance, you can scan a bar-code while standing in a store, and find multiple companies ready to sell that product to you. For a local bar, when business is slow they can blast out a thousand text messages, and have people in their door in a matter of minutes. - How do you measure ROI. That's where biz360 comes in.